I was holding on to my seat from the time the movie started. 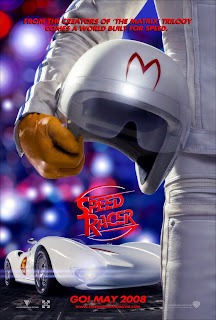 I first saw Speed Racer’s advertisment in a billboard along EDSA as I was driving. Then, with the racer-wanna-be that I am, I googled it right ahead. The movie will be showing in May and the protagonist is my favorite boy-next-door character – Emile Hirsch (lead guy in the hit movie Girl Next Door). Christina Ricci is his leading lady and that made it much more interesting. I found out that Speed Racer is a 1960s Japanese anime series. I asked my boyfriend about it and he said that he watched some episodes. He even knew the theme song. I didn’t expect the movie to be this nice. It’s cinematography is very detailed and very good. I love the cars and the old-school meets new era design. I loved the speed, the action, the hyper reflexes and everything. The story itself is not bad and the graphics are totally awsome.